Tables featuring tight players can be a profitable venue for the poker player who is able to properly adjust their strategy accordingly. Adjustments will need to be made in several areas to avoid tricky post flop situations. This article will look into some of the key poker strategy adjustments required to help you win at tight tables today. Firstly we will look at the nature of your tight opponents, the kind of starting hands that they are playing and their likely betting patterns before and after the flop. We then look at how having tight opponents affects your own starting hand selection and post-flop strategy in a variety of situations. Finally we cover how your position at the table relative to certain types of tight opponent will further affect your strategy. What is a tight poker table? Tight players can be defined as those playing few hands pre-flop – in some cases less than 10% of all starting hands. The characteristics of tight players mean that they will normally raise with the hands that they play – since these are generally strong. Since they have waited a long time for a quality hand in many cases, some tight players are reluctant to let go of these strong hands unless they are sure that they are beaten. Tight players play very few hands, and tend to stick to premium hands when entering a pot. While not all tight opponents are equal, we can make some assumptions based on their reluctance to get involved in a pot without solid values. Firstly, you will need a strong hand yourself to call a raise from a tight player (see the gap concept). Secondly, we can expect a tight player to bet out on a variety of flops – but be less likely to call a big raise when a "scare card" (for example an ace when the tight player holds a pair of queens) hits the board. The strategy adjustments required to beat these kind of opponents will affect many areas of your game. You should be less willing to call a raise from a tight player – but more willing to open a pot for a raise yourself. Raising has two key advantages. Tight players will often "tip you off" when they hold a monster by re-raising. Importantly, they will also fold regularly to any show of strength – enabling you to build you stack by picking up blinds and small pots where none of your opponents have hit a strong hand. Tight players tend to be a little easier to read than loose players, but this does not necessarily mean that it is more profitable to play against them. Post flop play against tight opponents involves making some assumptions about the likelihood of them hitting the flop based on the texture of the community cards. Tight poker table hand example. A good example is when 3 low cards come on the board – or perhaps a small pair with a medium card. The nature of your opponents means they will be heavily favoring high cards. Since there are more unpaired high card combinations than pairs (for example A-K can be dealt 16 ways while A-A or K-K only have 6 ways each) the flop is likely to have missed the majority of their hands. Here a small bet will often take the pot uncontested from your tight opponents. Another tight poker table hand example. A second example involves a flop with a number of draws – for example 5 6 8 . Here imagine that you called a bet from position before the flop and your tight opponent now bets into you on this board. Being tight his most likely holding is an over-pair to the board, the bet designed to protect this hand from the numerous drawing hands. Here is a situation where calling this bet, then raising heavily should a 3rd suited card or card that could have made a straight arrives on the turn. While this strategy is more risky it carries the benefit that opponents are unlikely to have bet before the flop with a drawing hand themselves. In both examples the nature of the particular opponent should be taken into account. While many tight players will lay down their hands in the face of strength or a draw heavy board – some will not. If you run into a tight / passive opponent who will call all the way with K-K on an ace high flop then add them to your ‘buddy list’ immediately – this opponent is perfect for value betting those times that you make a strong hand and will often pay you off with their entire stack. Position strategy at tight tables. Your position at the table is another important factor in winning at tight tables. This includes both your position in relation to the dealer button and your position in relation to the pre-flop raiser. From the dealer button you can open up your starting hand requirements at a tight table, from any late position you are mathematically favored to steal the blinds against opponents with small calling ranges. Acting last after the flop will give you more information at a tight table than at a loose one. At a loose table your opponent is likely to continuation bet as a matter of course – a raise and a re-raise ahead of you at a tight table is more likely to reflect the true strength of your opponent’s hands, allowing you to exit the pot cheaply. Relative position at a tight table. Calling a raise from early position at a tight table can leave you vulnerable to being sandwiched between the likely post-flop raiser and any opponents left in the hand. Since opponents are likely to play strong starting hands this can potentially lead to difficult decisions after the flop – for example your top pair may be ahead of the original raiser but an opponent behind you may have hit a monster. Sitting immediately to the left of the preflop raiser can cause more problems than you might think. Avoid these situations by ensuring that you will act last relative to the likely raiser after the flop. Take a look at the article on relative position for more information on this topic. 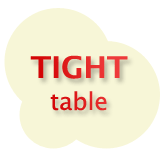 To summarize, adjusting to tight tables involves several interlinking factors. Bluffing, particularly on low or draw-heavy flops goes up in value (however you must give up quickly if called! ), value betting becomes opponent dependant and is very lucrative against a tight / passive opponent. The value of position, both absolute and relative, increases as post flop bets (or checks) are more likely to reflect the true strength of your opponent’s hands.